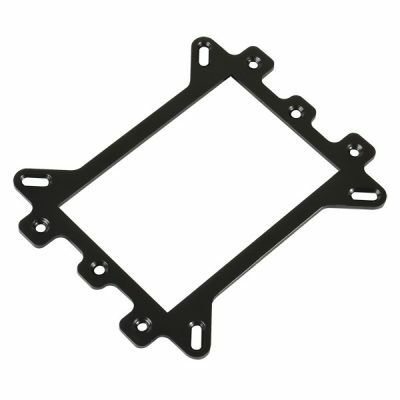 Venturing into uncharted waters, famed Aluminum chassis manufacturer Lian Li has announced their new CPU water block CB-01 will be available soon in the US. 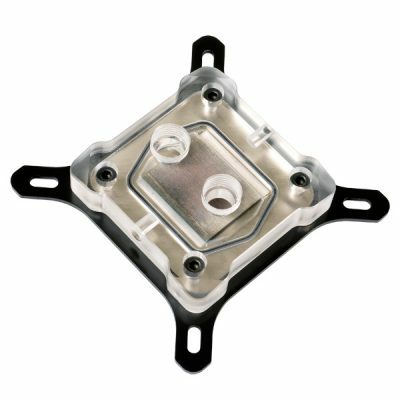 This is the first time Lian Li has offered a liquid cooling block. The CB-01 has a cold plate made of nickel coated solid copper with a final layer of tin-cobalt for corrosion resistance. 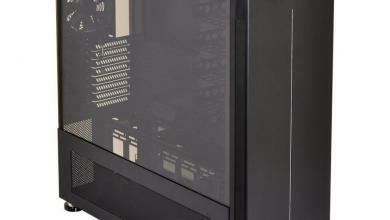 The top part of the CB-01 is clear acrylic with pre-drilled holes for 5mm LED lighting so modders will be happy. 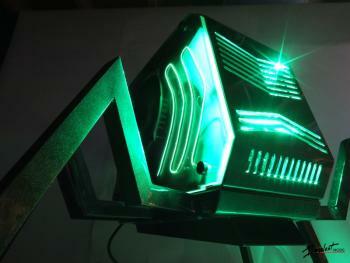 It is also compatible with all current AMD and Intel motherboards which includes LGA775 and 1366 support. 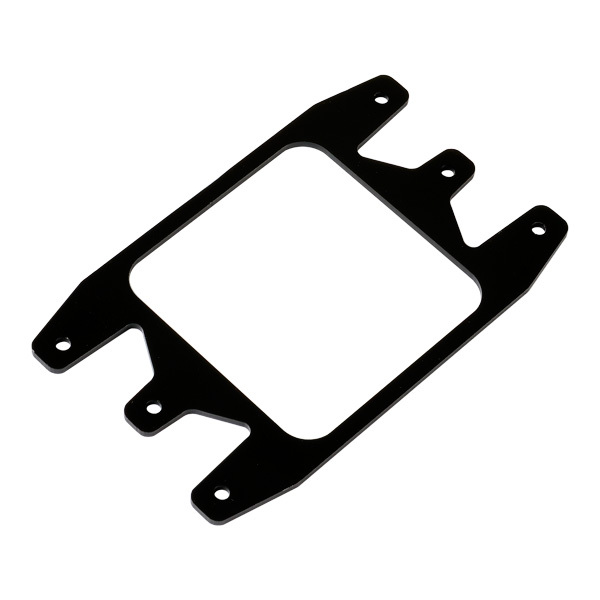 November 5, 2015, Keelung, Taiwan – Lian-Li Industrial Co. Ltd announces the CB-01 CPU Water Block. 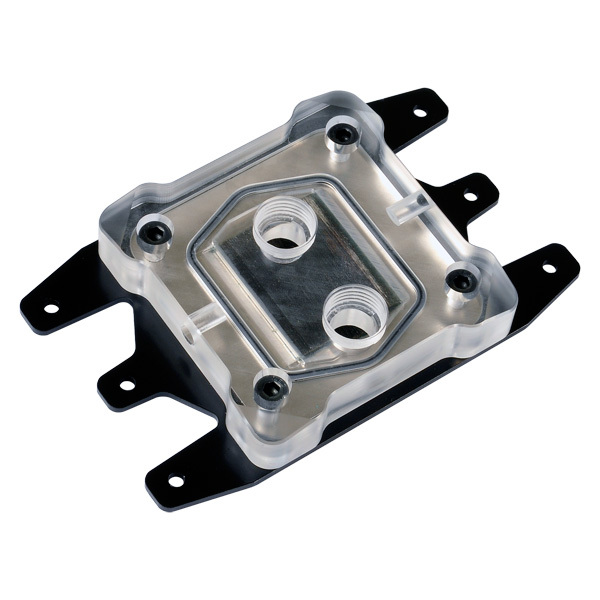 Manufactured by Lian Li in partnership with cooling experts from Overclockers, UK, a world-record overclocking team, this is Lian Li’s first water block ever. With their passion for quality materials, the CB-01 is made to the same exacting standards as Lian Li’s outstanding cases. The cold plate has a heart of solid copper in a nickel coating and a final layer of tin-cobalt for extra cooling, durability, and corrosion resistance. 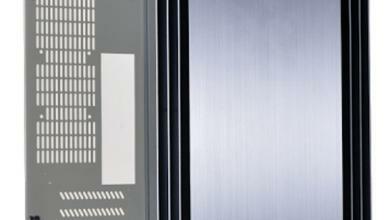 The top is a translucent acrylic block that visibly guides the cooling waters through the microchannels. The simple yet sturdy mounting fits virtually all modern and past motherboard sockets securely. For a bit of flare, there are holes pre-drilled for 5mm LED lights. 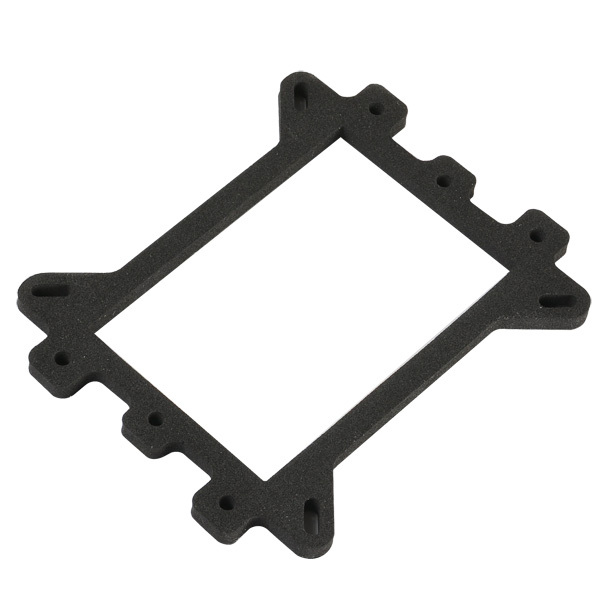 The CB-01 fits any modern Intel socket, including 2011/1366/1155/1156 and 775. 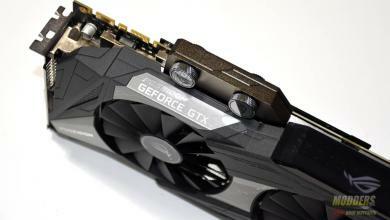 For AMD, it supports AM2+/AM3/AM3+/FM1/FM2 motherboards. 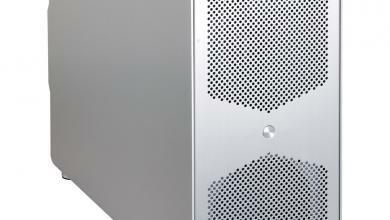 The Intel plate comes pre-installed on the CB-01 but the AMD bracket, if needed, is easy to swap in. There are back plates for both AMD and Intel CPUs and a universal, dense foam spacer to protect the back of the motherboard. The CB-01 is installed simply by screwing in 4 standoffs then screwing spring-loaded nuts down onto the long bolts. 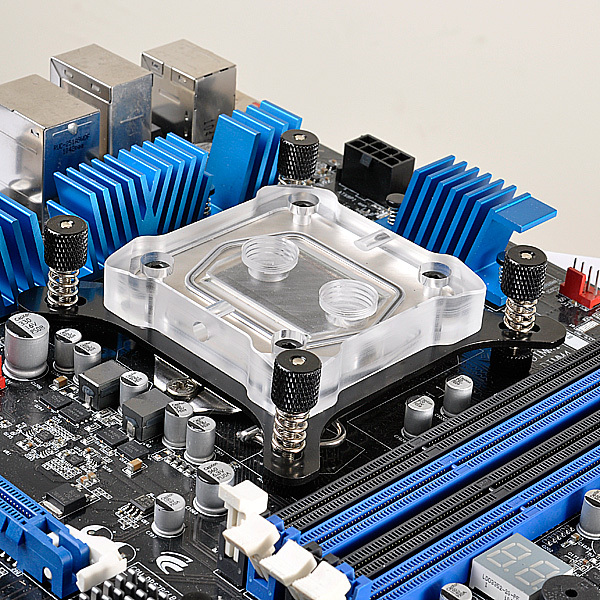 Like all CPU coolers, Thermal Interface Material (TIM) must be used between the cold plate and the CPU plate, applied according to the thermal paste manufacturer’s guidelines. There are many reasons to water cool a PC: better overclocking performance, quieter operation, fewer fans, or saving space. 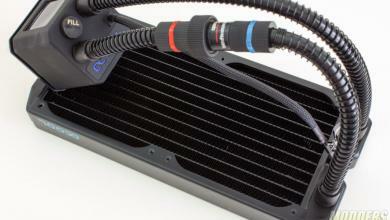 Even when hooked up to fittings and tubes, the CB-01 takes less space than a stock cooler. 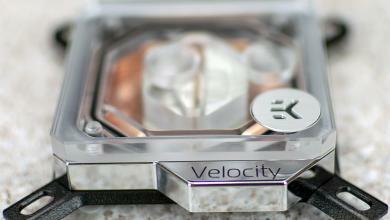 Its efficiency allows the radiator fans to be pushed to their peak for overclocking, or slowed to near-silence without losing normal performance. It can do all that and look good doing it – albeit lacking Lian Li’s hallmark brushed aluminum, the CB-01 still looks fantastic.